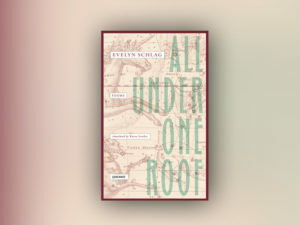 The afterword to All Under One Roof (translations by Karen Leeder of selected poems from Evelyn Schlag’s last two collections) is a good place to begin appreciating her work. Starting with her childhood understanding – or lack of it – of Europe, it offers us an illuminating selection of personal recollections and self-examination. Her parent’s year-long relocation to America in 1957, when her father went there to study the art of anaesthetic, left her at age five in the care of her grandparents. Later she would go to America (and find herself studying Elizabeth Bishop’s family Bible) but the potency of what her parent’s absence meant to her all those years ago ‘never vanished from my life. It took a seat on various chairs in my texts.’ This is worth knowing, not because this incident particularly informs Schlag’s poetry, but to remind us that these are poems of a writer acutely sensitive to the idiosyncrasies of both her own life and the lives of others. bends towards your sign and turns away. your eyes against the wind. As with so much of her work in this collection, this is not a poem that has any particular intent upon us and we are left to react to experience rather than find a meaning. This is no bad thing. There are several poems built around painters or paintings, suggesting that Schlag takes a visual artist’s approach to colour and texture. ‘Portrait of Cecilia Gallerani (Lady with the Ermine)’ observes da Vinci’s enigmatic canvas but quickly develops into a canter through the poet’s response to the painting, rather than what the painting may mean. And the poem that follows, a tiny essay on Gauguin’s painting Nafea Faa Ipoipo, packs its six lines with tantalising conjecture. Accepting that paintings are so many things simultaneously – narrative, character, documentary, but also sometimes simply shapes afloat in other shapes – might be a reasonable way of approaching many of Schlag’s poems: look closely, very closely, then take several steps back for the bigger picture. The pleasure of her poetry is, to paraphrase the closing lines of her afterword, not in their usefulness or usability, but in seeing ‘Words arrange themselves to their liking’.